Combining the features of their Omloop bib with a little less thermal protection than is standard for winter riding apparel, these lightweight bib tights offer a more breathable layer for milder, warmer winter conditions that we're starting to see more and more of. Whether you've experienced the warmer, wetter winter weather that we're seeing here in the Pacific Northwest, or you want a more versatile transitional bib tight, the Castelli Men's LW Bibtight has got you covered. Featuring a blending of lightweight, breathable Thermoflex panels up top, with water-repellent Nano Light panels down below, the LW offers the best of both world, without resorting to bulky, burly softshell tights. Inside the tight, Castelli implements their well-loved, often-used Progetto X2 Air chamois, featuring 4-way stretch, seamless fabric over multi-density padding for all-day comfort. 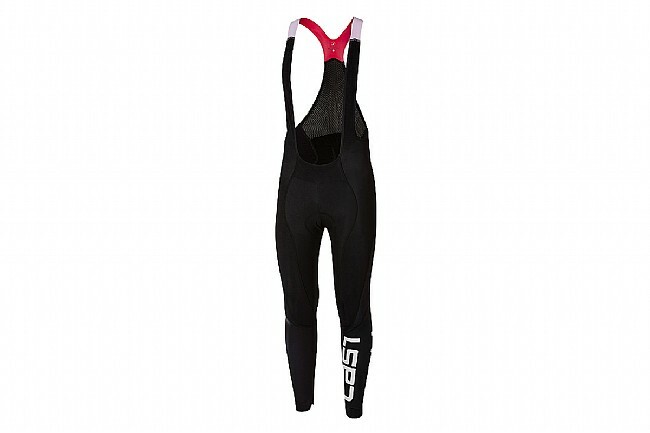 Lighter-weight bibtight for light winter conditions. Lower panel in Nano Light fabric for splash protection. Progetto X2 Air seat pad for long-distance comfort. Mesh bib straps so that you can regulate insulation with your base layers, not the bib. I use these for mid 50-60's temps. High quality product and good fit. Perfect for autumn time.